-Raise money for the ECFE classrooms. -Advocate for ECFE in the community and the legislature. -Coordinate events that bring families together. -Provide feedback to ECFE Administrators on classes. Q: Why is volunteering for the Parents Council important? A: We think that ECFE is a valuable program that we want to continue to thrive, and to be around for our children's children. Volunteering with the Parents Council allows us to support ECFE directly and achieve that goal. The ECFE Parent Council is a 501(c)/nonprofit organization. Q: Do Parents Council members get priority when signing up for ECFE classes? A: This is a great benefit for joining Parents Council! While Parents Council members are not guaranteed a spot in any class, they do move up the priority list, and generally get their first or second class choice. Q: May I bring my child(ren)? A: Yes! Feel free to bring infants into meetings - and to nurse/bottle feed. Young children are welcome, too. ECFE childcare is available for them in a different room, but on the same floor. 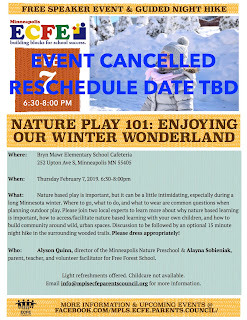 If you would like to request free childcare, please call 612-668-2127 by noon on the Monday before the Parents Council meeting. Otherwise, childcare may not be available. Q: May non-Parents Council members come to meetings? A: Absolutely. All ECFE participants—Parents Council members, or not—are welcome, can participate during the open forum/check-in time to raise concerns, and to ask questions. Upcoming FREE event sponsored by the ECFE Parent Council, please join us! Speaker: MariAn (M.A.) Klein is a founding member of the Minnesota Chapter of Moms Demand Action for Gun Sense in America. She has been a member of the organization for 6 years and is currently on its leadership team. While she has had many roles, one she is most proud of is being on the team who helped lobby passage of the Domestic Violence bill into MN law. Description: Each year in the United States, nearly 260 children aged 17 and under gain access to a firearm and unintentionally shoot themselves or someone else. Nearly 600 more die by suicide with a gun each year. In MN, 75% of gun deaths occur from suicide. Join us as we discuss the Be SMART framework. A way to help parents and adults proactively navigate tough conversations and take responsible actions that can prevent child gun deaths and injuries. Back for a second year due to high demand! 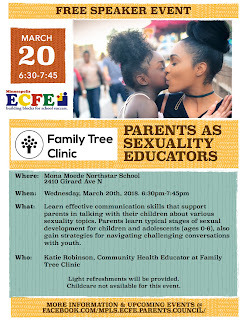 Learn effective communication skills that support parents in talking with their children about various sexuality topics. Parents learn typical stages of sexual development for children and adolescents (ages 0-6), also gain strategies for navigating challenging conversations with youth. 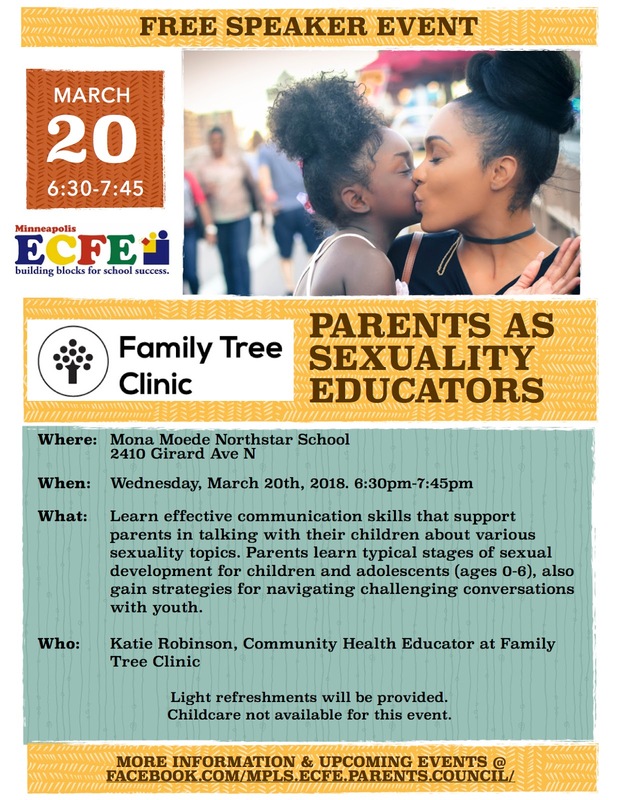 Learn from Katie Robinson, Community Health Educator at Family Tree Clinic. 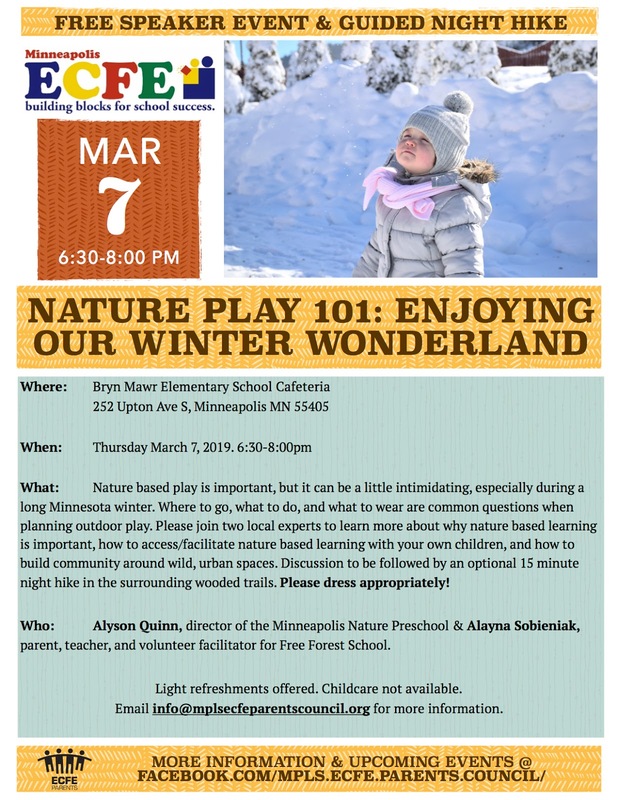 We have rescheduled our Nature Play 101 Discussion for Thursday, March 7th. 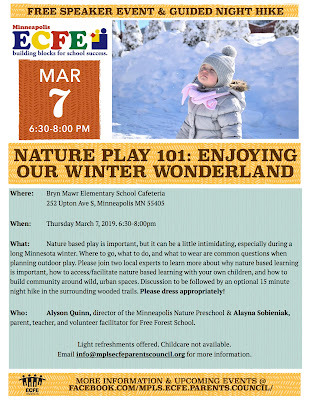 Thanks to everyone who attended our February Minneapolis ECFE Parent Council Meeting! 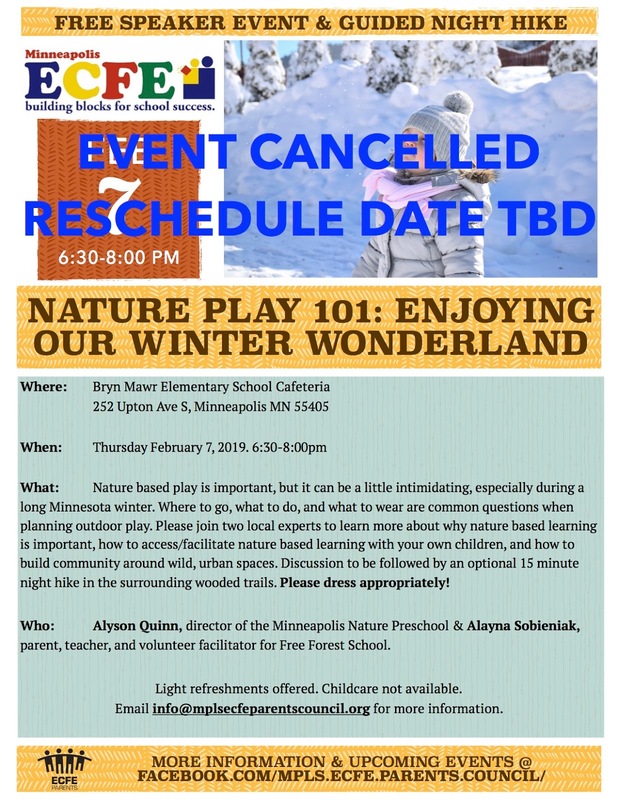 Due to weather conditions, Minneapolis Public Schools have cancelled after school activities, which will close Bryn Mawr Elementary. We are looking for a reschedule date and will post that as soon as we have it.